As a community worker at a Sexual Assault Centre, one of the most commonly asked questions I get is, why do you work at the Centre? People are usually pretty apprehensive about asking me this and brace themselves for the answer. In reality, it is a logical question with a surprising answer. Yes, that Disney film from 1981. This is the first film I clearly remember seeing in a theatre. Ask anyone who knows me well and they will tell you that this film has had a profound impact on my life. I have yet to sit through it without crying. 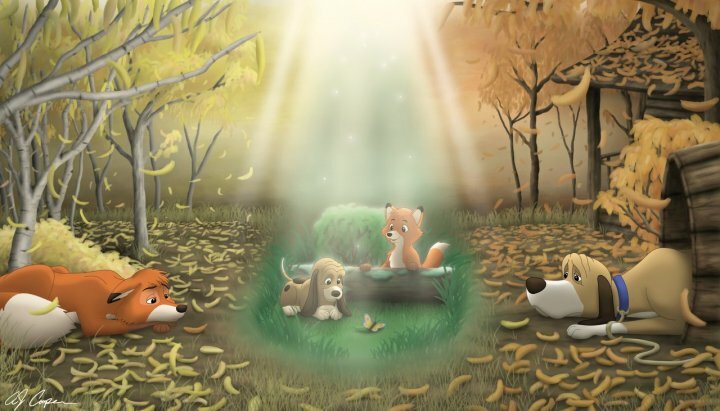 The film centres on the friendship of a fox kit, Todd, and a hound puppy, Copper. Todd is orphaned and taken in by Widow Tweed, while Copper lives on a neighbouring farm of a hunter named Amos. The pivotal scene for me is when they are playing together in the forest and they pledge their loyalty and friendship to one another for their lifetime. When Todd says “we will always be friends forever, right?”, is the moment, at the age of five, that my politicalization was born. I knew that Amos was not going to allow this friendship and would do all he could to quash it. I knew their friendship would not be forever. All because one was a fox and one was a hound. Their feelings for each other meant nothing because in Amos’ eyes the world created them as enemies. I knew then that arbitrary boundaries had been created for one to have power over the other. In order for the hound to hunt the fox for the hunter to sell the pelt, they would have to be enemies. Their promise of friendship would not keep. There are so many unjust, cry-worthy moments in the film. Such as when the mother fox, as per classic Disney style, gets killed in the first two minutes, or when Widow Tweed realizes that she must sadly release Todd into the wildlife reserve in order for him to have a full, safe life. The sacrifices in freedom that people make in order to survive are expressed over and over again in this film. It is not my place to make assumptions about the motives of Disney when this movie was created. And I am certainly not putting this film up on a pedestal to trump other great, more serious films of social justice like Malcolm X, Bread and Roses, or Hotel Rwanda. So many films, books, people, and experiences have shaped me and drawn me to my community work, but this film is what initiated the spark. I was not raped. My story is short. I went to university, and I have a loving, community involved family. My desire and need to work in the community has been nurtured by all those in my life who give to their community. I think it is important to reflect on why we do what we do and how could we give more to our communities both locally and globally. So to answer the question I have been asked hundreds of times in the last decade, the freedom for Copper and Todd to be friends is why I do my work. Thank you Carrie for sharing that, it has inspired me to do more. More community work, more for myself and more for my family and friends.